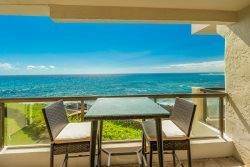 Dramatic ambience and Upgraded Oceanfront DLX 2BR Poipu Shores 206A Air Conditioned! Rich and Soothing, this Island Retreat is a treat for the senses. This rich and open Poipu Shores Condo unit makes the perfect Island getaway. Designed and hand-crafted with high-end finish materials, fine fixtures, solid wood furnishings and sea grass flooring, you will be surrounded by quality and Island elegance. The dreamy master bedroom suite has a stunning ocean view with a bamboo King sized canopy bed and a master bath suite featuring vessel sinks and travertine flooring. Fall asleep to the sound of the ocean reminding you that you are vacationing in one of the most incredible and remote places on the planet. You will notice many special touches found in Unit 206A including fine linens and a host of other amenities (list to the right) to ensure that you have everything you need for an incredible vacation on Kauai. Fully air conditioned condos are hard to find on the water in Poipu but this condo has it. It will help make your vacation just perfect. The second bedroom is fully self-contained with its own bathroom and vanity. This garden side guest bedroom has its own bamboo canopy queen bed and the area can be closed off for complete privacy. While the garden side guest bedroom doesn't have an ocean view, the tropical bird songs from the garden area are lovely. The fully-equipped modern kitchen is gorgeous and functional. Copper countertops create a warm feeling, with quality appliances and all the items you'll need to make any culinary delight or libation from a Thanksgiving dinner to a tropical drink. Shared gas grills are located on the ground floor of the building where you can cook up the catch of the day! Email response that maintenance would be by to fix fire alarm. Never fixed while we were there. Overall, we were satisfied. Thank you. We very much appreciated how responsive everyone was. Thank you for sharing your lovely home in paradise with us. It was an idyllic place to spend our honeymoon! Could not have been any easier. Very responsive and accommodating. Thanks for letting us share in this magic. We were absolutely mesmerized with the view and the ongoing water show of the surf, seals, turtles, and whales! Super comfortable bed with an amazing view of stars and sea. Tasteful furniture and decor. Location, location, location.....this is it! We contacted Tom and Patricia a few times and they were responsive and very nice. Always able to direct our inquiries appropriately - or answer. Thomas the housekeeper was very friendly and responsive as well. He had our unit ready a bit earlier for us which was very much appreciated. Our experience was great all the way around. Final payments are due 2 months prior to your stay. A check, money order or bank transfer is preferable, but a credit card can be used with a 3% processing fee. Visa and Master Card.